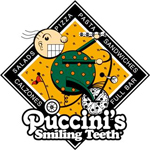 Review: Puccini’s Smiling Teeth is located right behind the Wabash Landing theater. It’s a pretty big restaurant, part of a larger chain that has locations throughout Indiana and Kentucky. It has a separate bar that stays open late, and a large family dining area. Our recent trip to Puccini’s was quite nice. It wasn’t crowded and we were seating right away. There were crayons and paper for coloring and the menu was pretty extensive. The food was good and plentiful. I ordered the pasta primavera. It came with whole wheat penne, which was pretty good. I thought I was ordering a healthy dish, but the entire thing was liberally covered in oil so I’m guessing it wasn’t quite so much. It wasn’t great, but okay. We also got bread sticks, which I didn’t care for the kids liked. My husband ordered the Sweet Lil Razorback pizza, which came with pepperoni, smoked sausage, and bacon and was really quite good. The service was okay. Nothing spectacular, but nothing bad either. A nice afternoon meal in a pleasant environment.